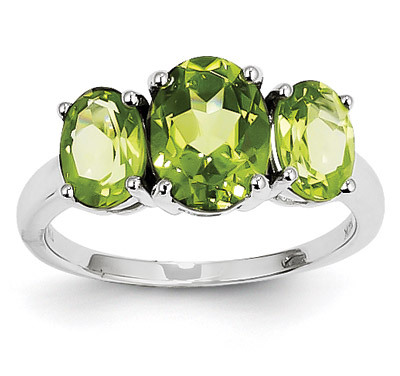 Three-stone oval-cut real peridot gemstone ring set in 14k white gold with a fine, polished finish. Perfect as a stand-alone peridot right hand ring, anniversary ring, or peridot engagement ring. Ring weighs approx. 2.75 grams. We guarantee our Three-Stone Oval Peridot Gemstone Ring, 14K White Gold to be high quality, authentic jewelry, as described above.